Houses built in Ireland before 1980 have no insulation. Up to 50% of the heat loss from a house occurs through the walls. This can be reduced by 60% by insulating the walls. 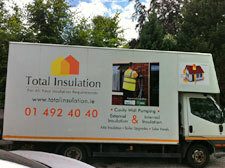 When considering wall insulation, first you should find out whether your home has cavity walls or solid walls. A building contractor or Insulation Contractor will advise you of that. In Ireland there are three types of home construction 1. Cavity Blocks walls 2. Solid Blocks walls 3. A two leaf cavity block wall that is two blocks on edge with a cavity in the middle usually between 100 mm and 150mm wide. 1. and 2. Cavity Block and Solid Block construction can only be insulated on the outside or the inside at a cost of between 50 to 95 Euros per square Meter and a lot of disruption to the home. 3. A two leaf cavity construction can be insulated by way of pumping a bonded bead into the cavity at a cost of between seven to ten Euros per meter depending on the width of the cavity. The cost of cavity wall insulation depends on a number of factors, including the width of the cavity, but it is typically in the region of €7 to €10 per square meter. For a typical semi-detached house, this gives a total cost of about €550-€950 With annual fuel savings of €200 to €320, the payback period will be in the region of 3 to 5 years. You may be able to negotiate a lower price if you can persuade some of your neighbors to have their walls insulated at the same time.